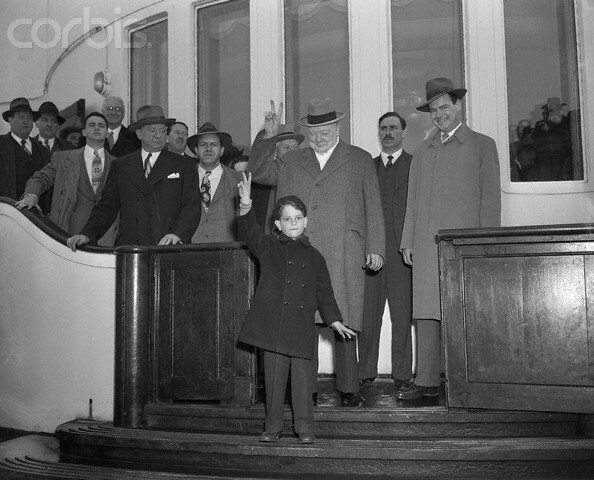 LONDON, Jan. 29 (AP)--Prime Minister Churchill disclosed today that he got a free ride to the United States and back aboard the Queen Mary. A Laborite member of the House of Commons demanded to know how much the prime minister's trip to Washington and Canada cost. Churchill replied that both he and Foreign Secretary Anthony Eden traveled as guests of the Cunard Company. A government spokesman added that overall expenses for the party of 35 who accompanied Churchill and Eden were expected to total about $41,000. When the Queen Mary ploughs her majestic way across the Atlantic on her maiden voyage next May the ship herself will "tell" the story of the trip. The B. B. C. have made elaborate arrangements for broadcasts, from the vessel from the moment she sails from Southampton until she greets New York for the first time. We will hear the excited voices of the passengers on the dock at Southampton, the loading of the luggage, the sirens of other vessels in farewell salutation. Then during the voyage we will be able to listen to a detailed descriptive [sic] pictures of day-by-day life on board. And last of all, across three thousand miles of ocean, will come the sounds of the welcoming cheers from New York. Mr. R. H. Eckersley, Assistant Controller of Programmes, will supervise all the broadcasts. Mr. John Snagge and Mr. R. H. Wood will be in charge of the technical side, and Mr. John Watt will produce. They, with about six assistants, will sail in the ship. 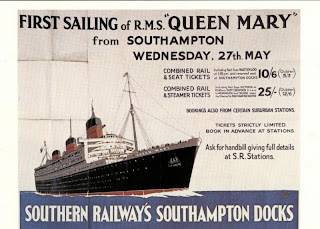 The departure from Southampton will be described in commentaries from ship to shore. On each night of the voyage a "flash" from the ship will be included in the news bulletins. The biggest broadcast of all is planned for the second night out. It will last for three-quarters of an hour and will take the form of a tour of the the ship. Forty points of the ship are being wired for microphones. It is in this broadcast that the B. B. C. intend to make the Queen Mary speak for herself. From the bridge we will hear the voice of the commander, grey-haired Captain Sir Edgar Britten, as he gives his orders. Then the clang of the telegraph taking the message down to the engine-room. And then...the throb of the giant engines....the chatter and laughter from the dining-rooms....the dance bands on the sun deck and in the ballroom....the quiet tones of the men in the crow's nest....the surge of the Atlantic. NEW YORK, Wednesday. 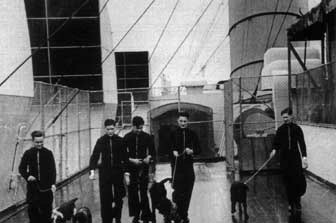 Mr. Winston Churchill left the United States to-day after an 18-day visit, sailing for home aboard the liner Queen Mary. 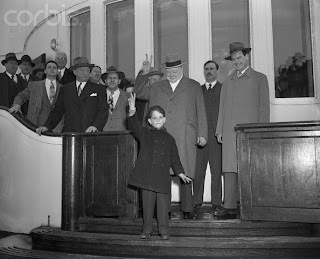 Several hundred persons were at the wharf to farewell Mr. Churchill. 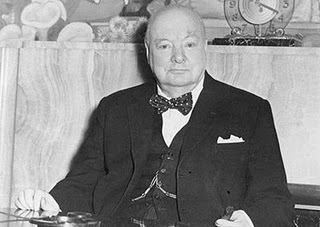 Mr. Churchill went straight to bed last night after boarding the liner, a Reuter correspondent reported by radio-telephone from the ship to-day. The correspondent's comments were heard on a televised news programme here. The interviewer asked about Mr. Churchill's cold. He was told that the Prime Minister's decision to retire early was unusual, as he was fond of staying up late. Earlier, in New York, Mr. Churchill was presented with New York [illegible] Medal of Honour in his bedroom. Wearing blue pyjamas, Mr. Churchill sat up in bed as the Mayor, Mr. Impelliterri, placed the ribbon of the medal around his neck. The eyes of the world will be on the "Queen Mary" when she makes her maiden voyage May next. Her main propelling machinery, consisting of four enormous steam turbines generating 200,000 h.p., calls for the world's best lubrication and leading Oil Companies have been vying with one another for the prestige of lubricating turbines of this mammoth vessel. The palm has at last been awarded. "Messrs the Vacuum Oil Company Ltd., Caxton House, Westminster, London, S.W. 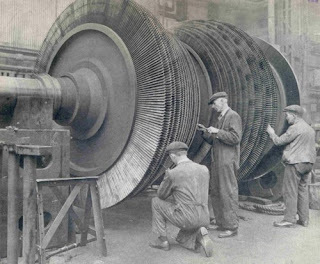 1., has just received an order from Messrs Cunard White Star Ltd. for the whole of the lubricating oil requirements for the main propelling machinery of the liner, "Queen Mary". The first delivery of over 20,000 gallons for the initial requirements will be made on December 23rd." Gargoyle D.T.E. oil supplied to the "Queen Mary" is of the same type as that used in the "Normandie," "Europa," "Bremen," "Majestic," and "Empress of Britain." This oil is also used very extensively in vessels plying on the Australian waterfront and in many other important industries. Lady Essendon, wife of the chairman of the Furness Withy Line, and Mrs. Fred Bates, wife of a director of the Cunard White Star concern, played the final part in choosing the fittings and decorations for the cabins of the great new ship Queen Mary. They travelled to Clydebank for this purpose, and they were shown 16 model cabins, built months ago in a loft near the berth of the half-finished vessel, in which experts had been trying schemes of furnishing and decoration. Gold-coloured tapestry, with Pullman beds, is the predominating scheme of the first-class cabins. The tourist cabins will be predominantly gold, with a diamond pattern, and the third class cabins, stated to be equal to second-class cabins in any other line now operating, will be carried out in a scheme of cream enamel. The company thought that a woman's mind would frequently notice things the most expert men might miss, and hence these ladies were asked to give final approval to the plans. Disputed Dog Arrives in U.S.
Rickey, an Alsatian dog who was the center of a court fight in England between an Air Force sergeant from Milwaukee and an English woman, arrived in New York Thursday to join his master, Sgt. Otto Virgin. Virgin, 32, won the suit in Ramsgate, England. Margaret Perkins, 24, and English hotel receptionist and former friend of the sergeant, had claimed the dog. Ricky [sic] arrived aboard the Queen Mary for delivery to Virgin, who is now stationed at Davis-Monthan Air Force Base, Tuscon, Ariz.
"I'm off to the north to see the Queen Mary to-day. The life of a ship's captain sounds easy to some. But there are heavy responsibilities, and I do not get much time for myself. Afloat I am king of a small community: but no king can rule without efficient Ministers of State, and much of my work would be impossible without tried and trusted officers." He will be in constant touch with all parts of his ship wherever he goes. There is a bedside telephone which connects with the officer on the bridge. Sir Edgar was asked: "What about the rule forbidding the wives of captains to travel in the same ship as their husbands?" "Well, it seems quite natural to me," he replied. "The managing director of a big business does not have his wife sitting in the office every day, does he? And neither does the commander of a liner. Lady Britton [sic] could not travel in one of the ships I commanded. It is an iron rule." Within an hour of the Queen Mary leaving Southampton on her first voyage, Sir Edgar will be faced with his most difficult task. As commander he has to invite certain passengers to sit at his table throughout the trip. He will have names before him representing British society, members of America's Four Hundred, and hundreds of other notable travellers. From these he will have to decide who shall be honored on one of the most momentous voyages ever made. Elaborate precautions are being taken to ensure that the Queen Mary does not meet with any accident on her difficult 15 mile journey from the Clydebank fitting-out basin to the Tail of the Bank, Firth of Clyde, where she will await her trials. Warning of the fouling of any obstruction on the way will be automatically signalled to the bridge by a sensitive apparatus, which is to be placed under the ship. Though the journey will take only about five hours, it will be done in two stages, so that the best of two succeeding tides can be used. Between the tides the Queen Mary will be at an old Admiralty wharf at Old Kilpatrick, which will be extensively reconditioned for the occasion. It is understood that the date of her departure has been provisionally fixed for March 23, but she may not leave until the following day. It is estimated that at the Old Kilpatrick bend there will be only about 10 ft. clearance between the river bank and the liner's propeller blades. To make her as light as possible all but two of her lifeboats will be towed to the Tail of the Bank. 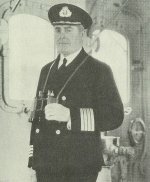 The two pilots, Mr. Cameron and Mr. Murchie, who supervised the canting of the Queen Mary into the fitting-out basin after her launch, will again be in charge.